Jamu Bersalin Maturnity Set complete 40 days care ( Sachets, Powder). Pregnancy and Birth is a natural process that occurs in every woman in any parts of the world. But sometimes the expiry of maternity body shape changes into their own fear of a woman. Often the questions will appear in the new mother of a possible body shape after birth. Therefore, support from people around, particularly husbands, are needed to reduce the anxiety that arises. 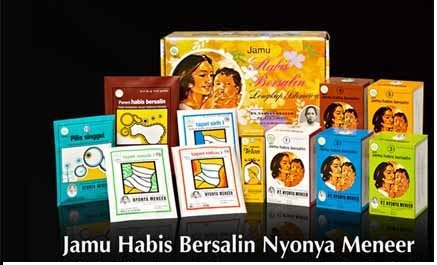 Why do you need Maternity Products Jamu Nyonya Meneer ? Recommended for each age birth mother to treat to treat her body as evidence of self-love in remembrance of the body within 40 days of determining a phase for mothers to be able to change and restore the appearance as before giving birth to remain attractive. One is to use Jamu Nyonya Meneer Complete package for 40 days. Maternity of this herbal medicine forms are in the packet that must be taken and used for 40 days as directed, because in a packet Jamu (Bersalin), there are herbal medicines for treatment inside and outside. This herbal medicine is good for women up to 40 days after birth..
- Useful to restore the uterus to clean, healthy and strong. - Strengthen the veins on the feet and hands. Maternity Parem For women who have exhausted childbirth, param is used to treat a cold and swollen, refine and strengthen veins and improve blood circulation. Rubbed on the body, legs or hands. Pilis Singgul This pilis good for women after childbirth so that the eyes become bright eyes so as not to prevent myopia, treat vertigo. Also excellent for women who work hard to treat the body. Tapel figure 1 Tapel good figure for women after childbirth 17 days, to treat all the wind in the stomach. Slim, delicate, refreshing and healthy skin. Telon oil 30ml This oil is useful to give your baby a warm feeling, but also to prevent flatulence and in the wind.